TaborGrass: Mountain Honey at Fremont Theater this Sunday, April 23rd at 4pm to 6pm! 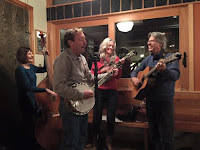 Mountain Honey at Fremont Theater this Sunday, April 23rd at 4pm to 6pm! Taborgrass’s own Mountain Honey will be performing at one of our favorite new venues, the Fremont Theater located at 2393 NE Fremont St. 97212. We’ll be playing some new stuff as well as some of our old favorites. I sure hope you can join us! No cover. Thanks folks! Greg.